Weeds must be present to control (Cattails and other emergent vegetation). Best kill when emerged weeds are actively growing — Add non-ionic surfactant to enhance uptake of chemical. Non selective — kills vegetation that receives treatment to the root. Safe for fish, swimming, waterfowl and livestock. DIAGNOSIS: Aquatic vegetation that has emerged from the surface and grows along shoreline. Down to-the-root control is needed. Dosage: 1 qt. makes up to 25 gallons spray solution. Treats up to 10,000 sq. ft./ 1/4 acre of target weeds. Thoroughly cover weeds for optimum kill. 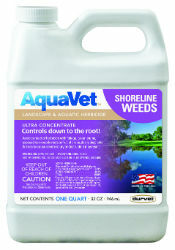 Frequency: Use whenever weeds are emerged and are actively growing.